(Newser) – Since NFL player Colin Kaepernick first refused to stand for the national anthem in August, he (and other protesters in the sports arena who've followed suit) has had his share of supporters and detractors. Count Ruth Bader Ginsburg in the latter category after a Yahoo interview Monday with Katie Couric in which she was asked about the patriotically-tinged hubbub. "I think it's dumb and disrespectful," she said, per Mediaite, adding she'd say the same thing about burning an American flag. "I think it's a terrible thing to do, but I wouldn't lock a person up for doing it." Thank You Ruth Bader Ginsberg for having the integrity, and may I say, Balls, to make decisions based on our Constitution, not your personal feelings.You Rock! 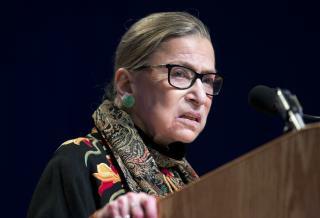 I'm surprised that RBG is sharing her personal opinions on such matters and especially surprised that she considers the exercise of a right enumerated in the Constitution "disrespectful." The NATURE of protest is disrespectful. I'd bet the British considered that little "party" in Boston harbor to be VERY "disrespectful." We have a Constitutionally enumerated right to speak our minds. It is the UNpopular speech that NEEDS that protection. I hope she lives 100 years. If the NFL hadn't taken a bunch of money from the military recruiting budget to turn the national anthem into a huge spectacle, the players would still be in the locker room when it played.